Flames shot into the sky as a gas explosion damaged several buildings in San Francisco. The blast sent panicked residents and workers in the city’s Inner Richmond neighbourhood fleeing into the streets as flames shot above the rooftops of nearby three-storey buildings. San Francisco Fire Chief Joanne Hayes-White said the fire was ignited when construction workers cut a natural gas line. The fire took three hours to extinguish. Authorities initially said five construction workers were missing following the blast, but the entire crew was later found safe and no other injuries were reported. Local resident Nick Jalali, 28, was cooking at home when the electricity cut out. Five buildings were damaged, including the premises of the Hong Kong Lounge II restaurant which regularly features on the city’s “best of” lists. The fire began on the street in front of the restaurant. Officials evacuated several nearby buildings, including a medical clinic and apartments, Ms Hayes-White said. Vehicles on a busy street were diverted as authorities cordoned off the bustling neighbourhood. Caroline Gasparini, 24, said she and her housemate were in their living room when the windows started rattling. She looked up to see flames reflected in the glass. Ms Gasparini said they saw employees of the burning restaurant run out the back door and people fleeing down the road. Firefighters worked to keep the fire from spreading while Pacific Gas & Electric (PG&E) crews tried to shut off the natural gas line. PG&E spokeswoman Melissa Subbotin said state excavation rules required crews to hand dig around multiple subsurface pipelines of various sizes before they were eventually able to “squeeze” a four-inch plastic line. She said since the fire was contained to a limited area, the utility had to weigh the threat from the fire against the risk that would come from more drastic action. PG&E spokesman Paul Doherty stressed the workers who cut the gas line are not affiliated with the utility, which is under heightened scrutiny over its natural gas pipelines. 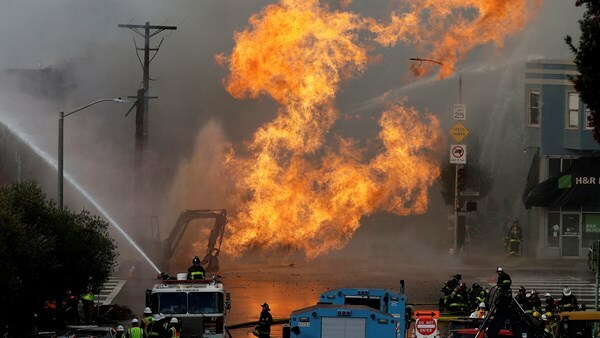 A PG&E pipeline exploded under a neighbourhood south of San Francisco in 2010, killing eight people.